TxDOT photo Flooding is still affecting the southbound lanes of U.S. Highway 281 north of San Manuel. Several water-filled barriers have been placed along the road. 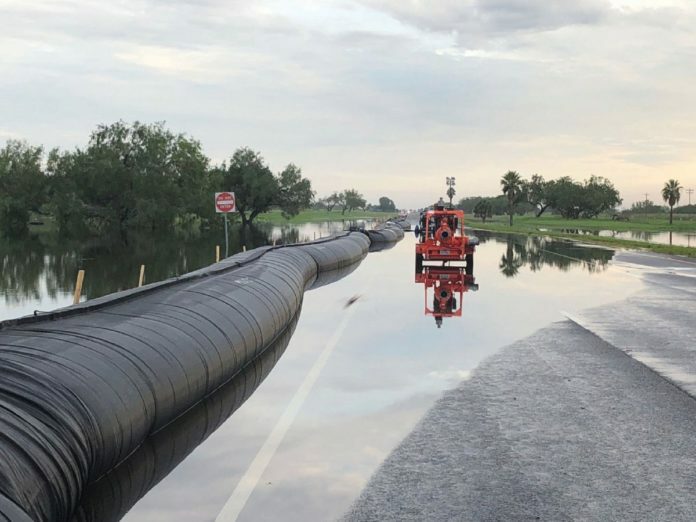 About 2 miles of southbound U.S. Highway 281 north of San Manuel outside of Edinburg remained closed Monday as water from storms last week and this weekend still obstructed the road. Texas Department of Transportation closed the southbound stretch Sunday afternoon, diverting traffic to one northbound lane, according to Octavio Saenz, TxDOT public information officer. Water began rising Saturday and overnight into Sunday, even though the rain had stopped. TxDOT originally only closed one southbound lane, but closed the entire section to help crews address the issue, Saenz said. On Sunday, TxDOT dug trenches and water-filled barriers were deployed along the road, which act like a dam as water was pumped off the asphalt, Saenz said. It was the first time this equipment was used since Hurricane Harvey. Saenz attributed the flooding of that portion of roadway to the frequency and the concentration of rain. “The underlying cause needs to be investigated … in order to prevent this from ever happening again,” said Saenz, adding that much of the land in that area is flat. TxDOT did not give an estimated time when all lanes will reopen. Story was corrected for spelling.